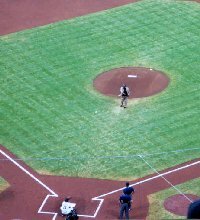 Most were taken from our seats in the upper deck just behind home plate, but a few were taken when Steve & I walked around the whole field before the game. 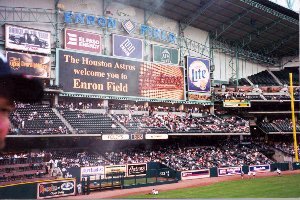 What a great ballpark! To view larger versions of the pix, click on the image or the appropriate link. These links just take you to the image files, so use the browser's back button to return to this page. Note: I did have some fun with PaintShop Pro on some of these images! 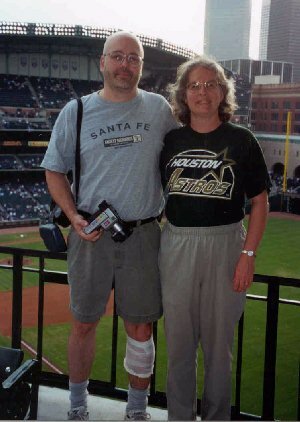 A helpful usher took this brother/sister picture while we were on our tour of the park. Note bandage covering horrific skating injury. I didn't make a bigger copy of this one. 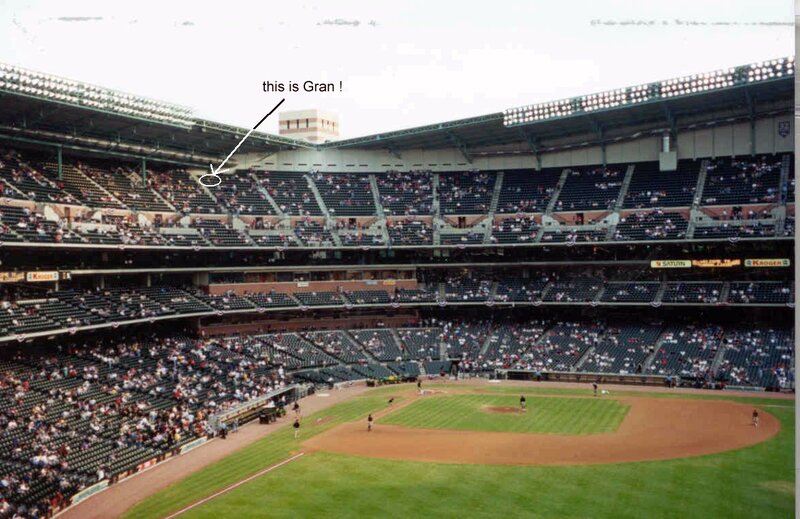 Click here to see a larger image of the area where our seats were as seen from the opposite side of the park. 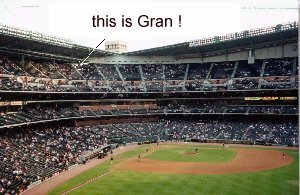 Sorry, but even the larger image isn't big enough for you to really see Granny. 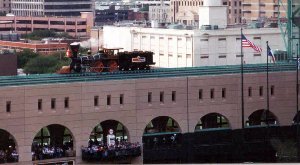 Click here to see the famous train in more detail. 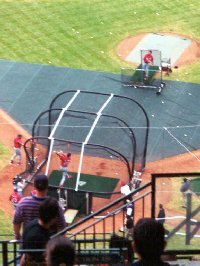 This is Mark McGwire taking BP. 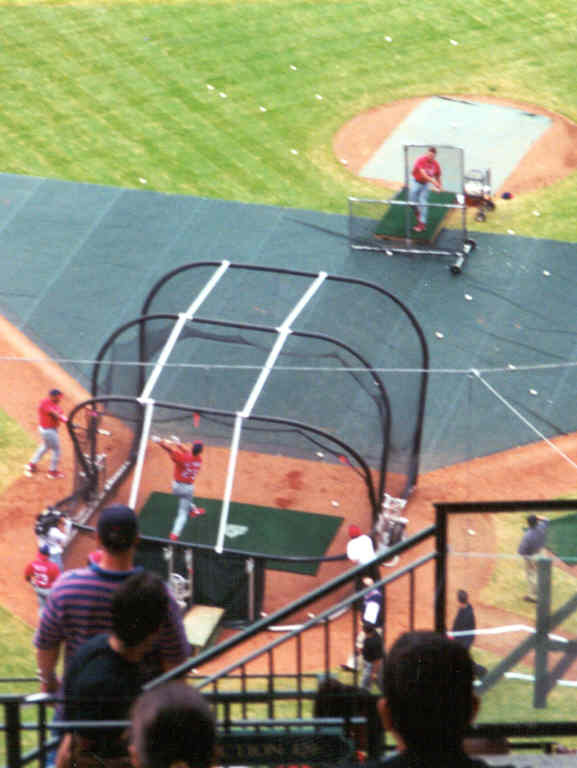 I think this swing is the one he hit out of the park. 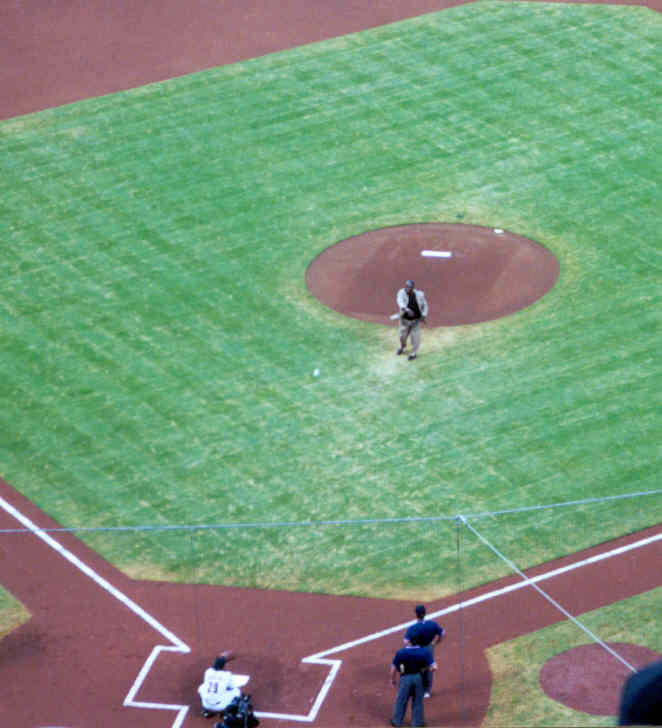 And here is career home run record holder Hank Aaron as he throws out the first pitch. 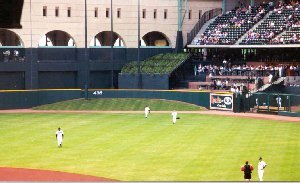 This is the way the scoreboard area looked before the game; there may be a little space left for more ads, what do you think? Click here to see how it could look. 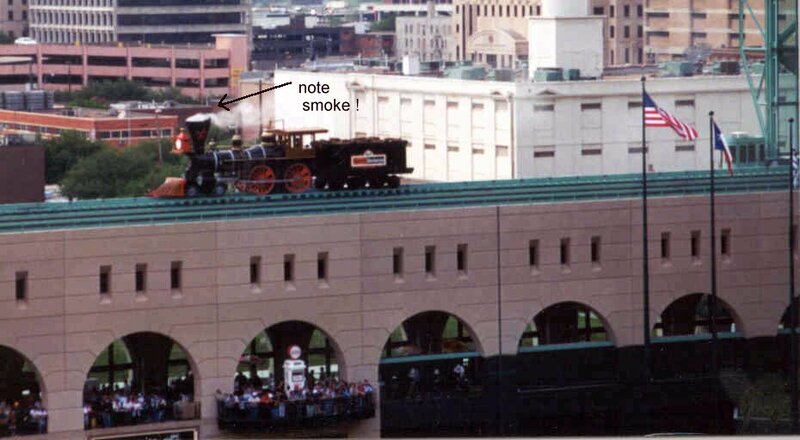 This picture was taken from above the Crawford boxes in left field. But this sure isn't a bad view looking the other way for $10 a seat! 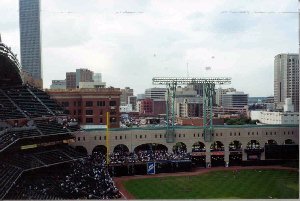 Click here to see a larger image of the view from our upper deck seats during BP. 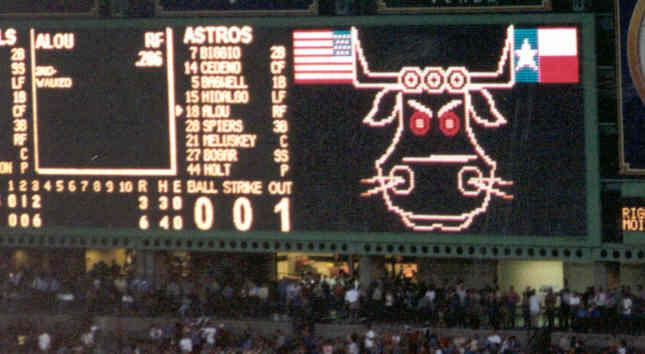 Who remembers the animated bull from the old Astrodome scoreboard? They've done a good job of reproducing it here. This was taken after Moises Alou had just hit a home run and we thought we'd surely win the game! 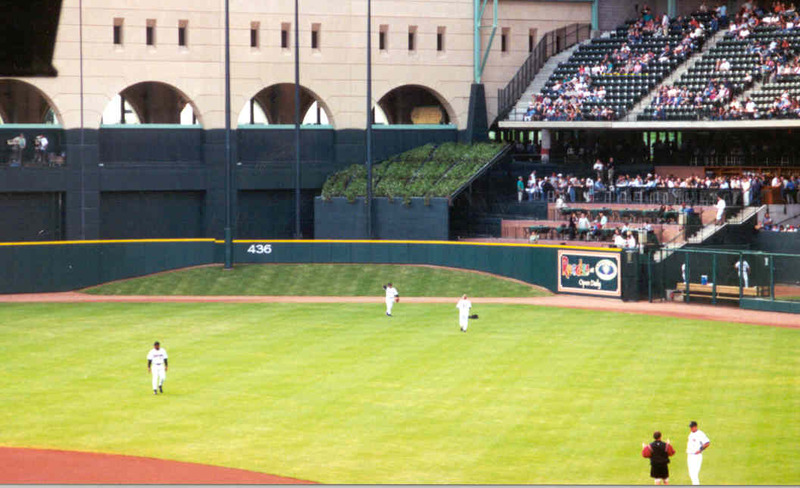 There really is a hill in center field. Plus some kind of plant growth beyond that we couldn't identify. Can you? Ruggles Restaurant patio is to the right of the plants. 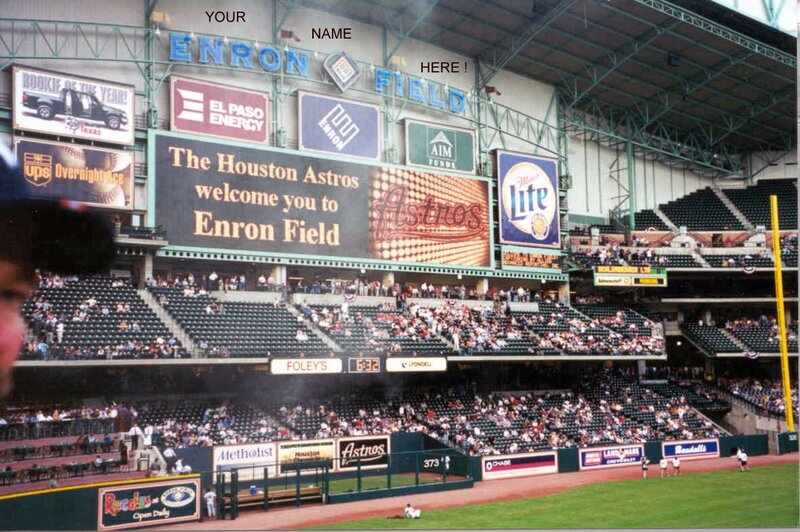 I'd love to watch a game from there someday.